Tidying up your garden and thinking of a bonfire to get rid of your rubbish or holding a Bonfire Night party? 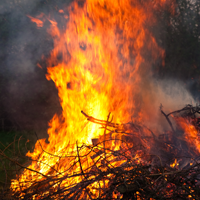 Build your bonfire at least 18 metres (60ft) away from houses, trees, hedges, fences or sheds. Make one person responsible for the bonfire, and allow only that person and designated helpers into the bonfire area. Bonfires should be no more than 3 metres in height. There should be a suitable barrier around the bonfire to keep spectators 5 meters away. Warn your neighbours beforehand. They are much less likely to complain if you light the bonfire at a time least likely to affect your neighbours e.g. not on a warm day when people will be in their garden. Before lighting the fire, check its construction carefully to make sure that it is stable, and that there are no children or animals inside. You could be fined if you light a bonfire that allows smoke to drift across a road and become a danger to traffic. Use domestic firelighters to light your bonfire. Keep some buckets of water or ideally a working hosepipe nearby. Keep children and pets away from the bonfire. All districts have kerbside green waste collections or you could take it to your local Waste Recycling Centre.